effects of light upon objects and capturing various atmospheric conditions. 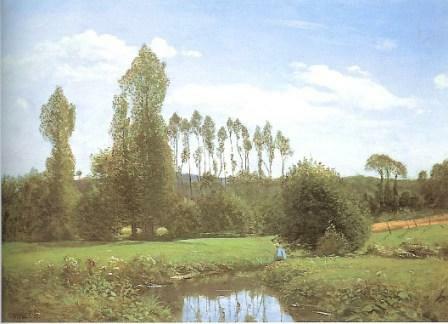 In 1860, Monet went to Paris, France to study at the Académie Gleyre, where he met Pierre Auguste Renoir, Alfred Sisley, and Jean Frederic Bazille. The four young men, as well as Camille Pissarro and Paul Cezanne, met frequently with Edouard Manet at the Café Guerbois, and it was from these conversations and associations that Monet began to develop his own theories of painting. From 1865 to 1871, he developed the luminous style that is most closely associated with the Impressionist movement. Technically, the Impressionist style results from the application of paint to white canvas in clear colors taken directly from the tube, and the technique is based upon the observation that objects take on color from surroundings, from varying lights, and from objects placed near them. Shadow in an Impressionist painting is no longer a dense black that has no color, but a varicolored combination of tones with light permeation. By 1872, after a stay in England where Monet studied the works of John Constable and Joseph Mallord William Turner, Monet was ready to set up his own studio on a boat at Argenteuil and paint river scenes in which all nature is reflected in water. Monet's friends gathered around him, and during the next five years the Impressionist movement flourished in a happy atmosphere of ideas and mutual friendship. Monet never ceased his studies of light and atmosphere. As the years passed, Monet's work became more atmospheric in effect, and in such series as the huge panels of Water Lilies and the smaller paintings of the facade of Rouen Cathedral, the artwork takes on a look that borders upon abstraction. Monet has carefully indicated the changes in color as light varies from sunrise to sunset and as atmospheric conditions vary from bright sunshine to rain, snow, or mist, sharpening or softening outlines to create an almost hallucinatory effect.